I am not a fantastic cyclist, so I need to ride my bike as much and as often as possible. To make frequent riding easier, I am trying to kit out my bike for all clothing, including skirts and longer jackets. Being a big dress and skirt wearer, a skirt guard is essential to my bike gear. Dress guards can be very expensive and/or can require drilling one's fenders to accomodate the guard. Lucky for me/us, there is a brilliant etsy shop poised to meet all of our skirt guard needs. 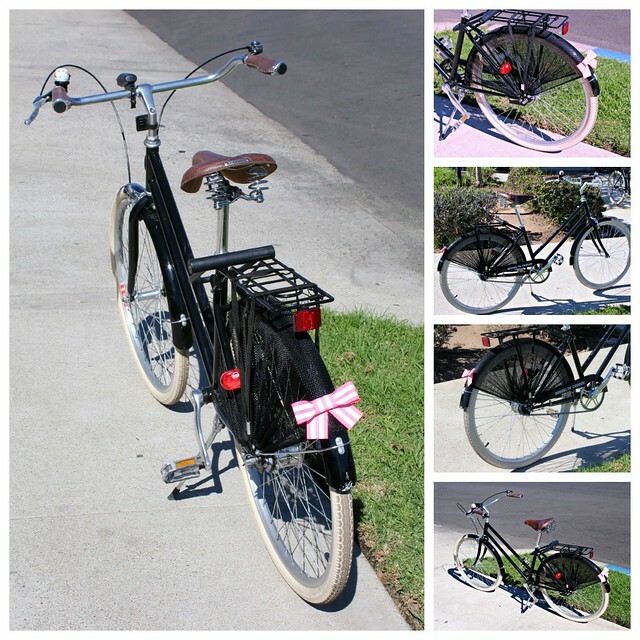 Frill Ride offers a variety of simple, fabric dress guards for any ready bike. From bridal rides to basic sport guards, there is probably a dress guard to fit your style and needs, though they skew feminine (in case you couldn't guess as much from the name). I chose a black fishnet/mesh guard that would blend into my black bicycle, but has a reflective pink bow on the back for fashion and safety purposes. I simply love it. The guard was easy to install, and seems likely to last for years to come.